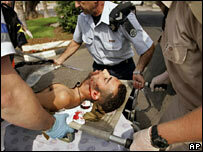 "We live in a rough neighbourhood" is a remark made very often to foreigners in Israel. It explains a great deal about the fierceness of the Israeli response to the capture of two of its soldiers by Hezbollah in Israel itself last week. Israel operates on the principle that anyone who attacks it will pay a price and argues that, like it or not, this is part of what the Middle East is about. However, it has another agenda and the worse its casualties, the more it is propelled towards trying to fulfil it. This agenda is to disrupt and reduce the power of Hezbollah, with which it has old scores to settle and which is also the main threat to any of Israel's borders. As Israel has again discovered, Hezbollah is also a threat to some of its major population centres. Just how far it is prepared to go remains unclear. The Israeli Prime Minister Ehud Olmert, for whom this is a baptism of fire, has spoken of "far-reaching consequences" after the attack on Haifa claimed eight lives, but has not been specific. Haifa was a blow for Israel, as the attack on its warship was. Such blows will influence Israeli intentions. There are two precedents for possible Israeli actions from recent history. The first is a ground invasion of southern Lebanon. In July 1993, in a campaign called Operation Accountability, Israel invaded southern Lebanon to attack Hezbollah. That invasion lasted for a week. The second precedent concentrated on air and artillery strikes. Such an operation took place in 1996 and was called Operation Grapes of Wrath. Its aim again was to attack Hezbollah. 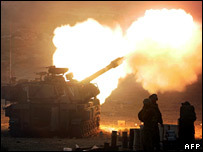 Israel fired more than 20,000 shells into Lebanon and one strike killed 118 Lebanese civilians sheltering in a UN base. Hezbollah fired more than 600 rockets into northern Israel. 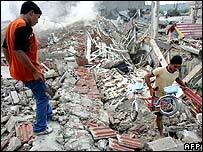 That conflict resembles this one - bridges and power stations in Lebanon were hit, as they have been in this confrontation. The 1996 operation lasted 16 days. So by that timetable, we have some way to go this time. Modern precision-guided weapons give military commanders many more opportunities to destroy particular targets, so that makes a ground invasion of southern Lebanon less likely. But it remains a possibility, especially if the rocket attacks into Israel continue, as they will. There is little doubt that Hezbollah knew what it was doing when it crossed the border on its raid and has presumably calculated that it will gather support in Lebanon while Lebanon is under attack. That is usually the result of air bombardments anywhere. Whether Israel can weaken Hezbollah sufficiently for the rest of the Lebanese government, of which it is part, to assert its authority and extend the power of the Lebanese army down to the Israeli border is doubtful at the moment. Yet the establishment of Lebanese government authority is the stated aim of the Israeli operation. The risk of course is that the conflict will spread. Israel is already laying down a barrage of blame on Syria and Iran, both backers of Hezbollah. But will that become a barrage of fire as well, especially aimed at Syria? Iran is too far away. Israel could undertake some kind of warning or punishment strike just to remind Syria which is the strongest power in the region - it has done that before - but it depends on how far it wants to take this. In the meantime, diplomacy is bogged down. The United States is reluctant to act and has lost influence in the Arab world over Iraq. It is giving Israel some time to accomplish some at least of its goals. There is no Henry Kissinger on the horizon. The G8 has issued a compromise statement that does call for the release of the Israeli soldiers, restraint by Israel in Lebanon and a withdrawal of its forces from Gaza. Is that a hint that the US has a time limit for all this? Or is it a green light for Israel to carry on with what it is currently doing? A widening of the confrontation is not inevitable. Sometimes the Middle East does draw back from the brink. But it is not guaranteed and in this situation there are no quick or easy options.